You may have noticed that in addition to your email marketing facility, there is now a contacts / address book area in your website manager. Price: Given to all our existing ready-made website customers for free! When you upload pictures to your website you can now choose to crop and rotate them using tools built into your website manager. A massive time and hassle saver! Many of our customers were asking for a greater choice of fonts to choose from. So you spoke and we listened! 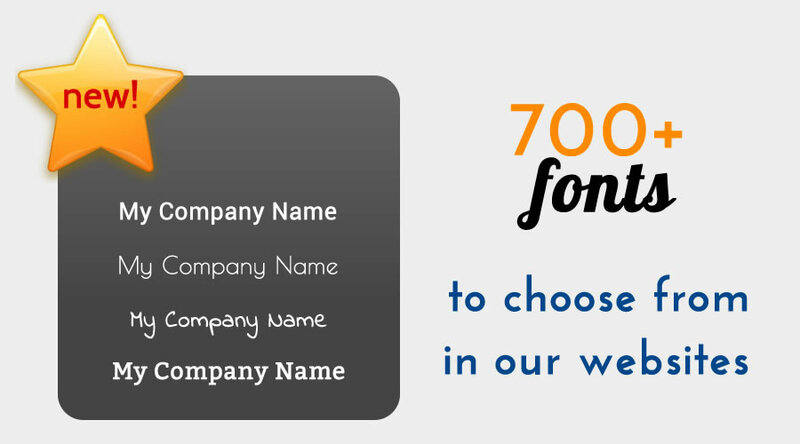 There are now over 700 fonts to choose from! 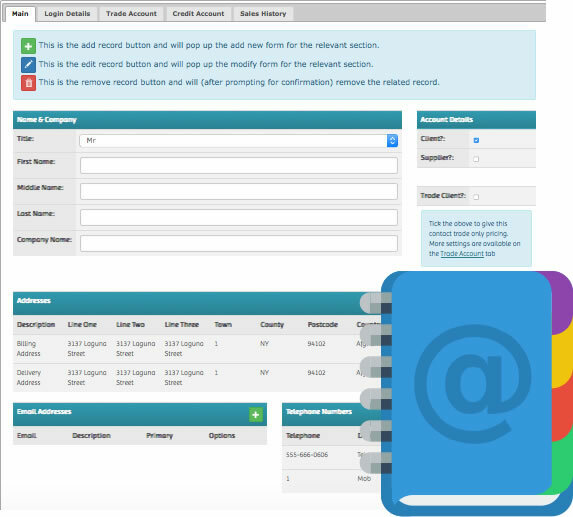 This allows customer to login to view their order history, print order history and change their details. Price for this module on its own: Given to all our ecommerce customers for free! ... if you're on a lower package you can upgrade to a package that includes this feature and all the other new features in this package! Call or email us about Christmas discounts on upgrading! This enables you to set up trade pricing for trade or special customers. 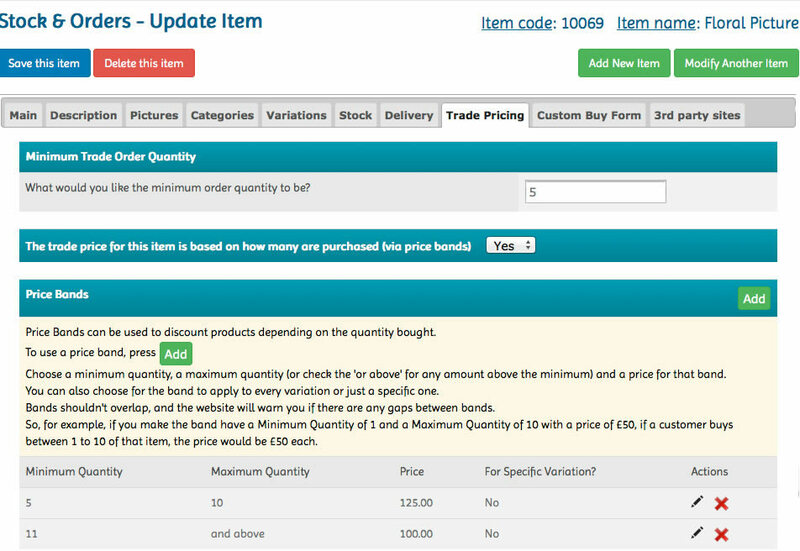 There's lots of ways you can set up the trade pricing, including that shown in the screenshot. When the customer logs into the website the trade prices are shown instead of retail prices. If you're a trade/wholesale only business, this module also enables you to hide all prices from your website until a trade customer logs in. Email marketing is a great and cheap way of making sales. Selling to people who've already visited your website or bought in the past (known as "warm" leads) is usually much easier than selling to people who've never been to your site before. So with the "Mailing List Subscription Popup Reminder" module your website will automatically popup a box asking visitors to subscribe to your mailing list. It's a great way of ensuring you have as many warm leads on your mailing list as possible. This enables you to have your website in several different languages. It can be incredibly useful even if you only speak one language! The translations are automatically created for you, or you're able to provide them yourself. Best of all each translated page has it's own web address in that language, meaning Google can index your website in each language! This can be a great way of getting overseas visitors to your site and also helping to engage any multi-lingual audiences you may already have. 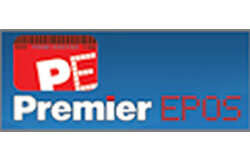 If you have an EPOS system provided by PremierEPOS and want your products to syncronise between your website and EPOS, then this module does exactly that for you! 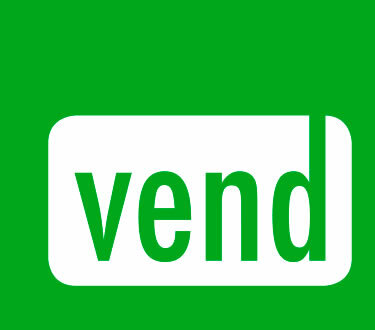 Vend is a great web based EPOS system which works on tablets, mobiles and desktops. Our integration facility syncronises product information between both Vend and your website saving you time and hassle. How many people bought X product? How many people enquired about X product? How many people viewed X product? Do you have products which can be customised? For example a mug which you can print text or a picture on for the customer? Well our Personalised products module enables you to offer this. For each product you sell in your shop you can specify which ones can be personalised. For each product which can be personalised you can specify exactly what can be personalised so when a customer wants to purchase one, they're asked for personalisation information, and perhaps pictures too! Do you take orders on the phone? Or perhaps at trade fairs? Would you like to be able to store these orders somewhere and see which customers they relate to? The offline ordering system allows you to do this. 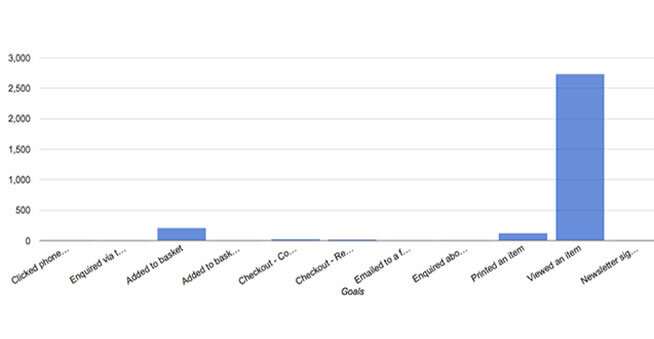 If you also sell online, you can also report on what proportion of your orders were made online vs. offline. Do you sell on ebay? Do you have products that can be personalised? Isn't it annoying that ebay doesn't have a facility to collect personalisation information? 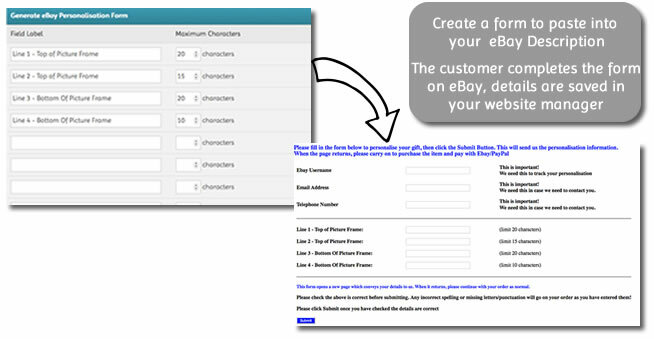 Well our ebay personlisation form creator could be the prefect solution for you! 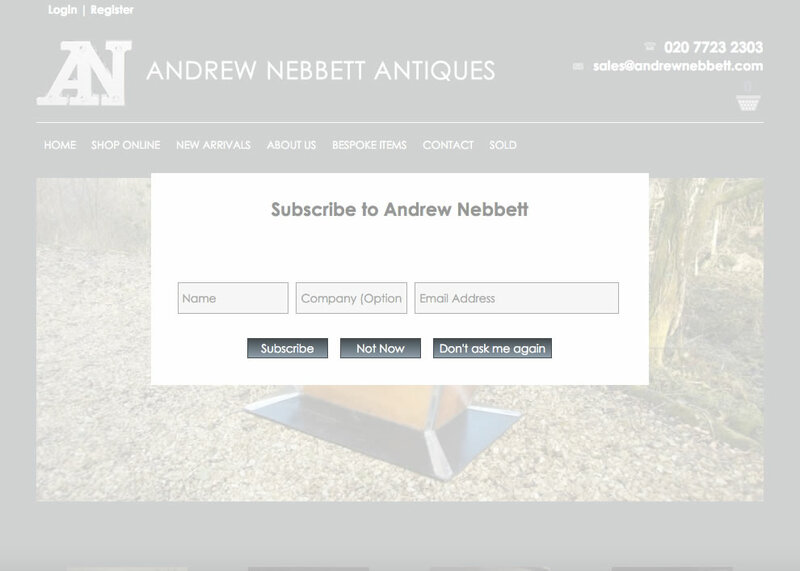 This allows you to create forms which you can paste into your ebay listing. So if you sell personalised mugs for example, you can create a form to put on your listing to collect the text and/or picture the customer would like printed onto the mug. The above doesn't include the countless days we've also spent on little tweaks, improvements and fixes we've implented here and there. 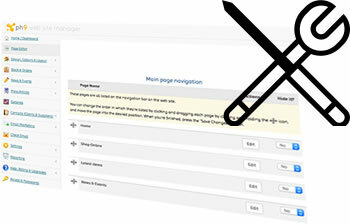 This can range anything from allowing you to enter in RRP prices to improving the layout of the website manager. We hope you like all the improvements we've implemented! Our mission is to make computers and the web easy to use; and we hope we've achieved that with everything we've done this year. Thank you all for your custom and support in 2015 and we look forward to presenting you with more improvements in 2016! We have a whole new range of ready-made site designs coming in 2016, plus a whole bunch more features. Watch this space!